Hurricane Gustav has already ravaged Haiti, The Dominican, and Cuba, and it's on its way to the U.S. If you're one of the 7.2 people who make your way here Saturday, Sunday or Monday I would like to ask you to remember the people of Louisiana, as well as those already affected by the hurricane. As you know Hurricane Katrina ripped through New Orleans and the surrounding area with fury 3 years ago. Now these people face the same kind of natural disaster once more from Hurricane Gustav. Pray for the safety of the men, women, and children involved. Sometimes it's easy to forget the danger that faces others, only because it seems far away. I do this, too. But in looking the other way we miss out on opportunities to make eternal investments in others. Prayer is a major investment that too often gets overlooked. But prayer changes things. While we may not see that investment pay off here on earth, we absolutely will in heaven. Let's pray together that God makes us mindful of this situation and everyone involved. Pray for His mercy to rain down stronger and swifter than any earthly disaster known to man. Pray for His grace and deliverance to flood the hearts and lives of those in harm's way. Thank you for the reminder that our neighbors do not all live next door. Prayers for guidance and protection. I am about 45 miles outside of New Orleans so the family that went back to the city have evaced here once again. We have a nice safe house. It was funny because my girls were 1, 3 & 5 for Katrina and when we told them a hurricane was comming they got excited because last time we said that, 13 people moved in with us for like 3 months. Storms do not scare me but my husband will go into work tomorrow and not come back till the storm has passed. He is on edge about leaving us and we will miss him but God still reigns. Thanks for the prayers. People hit by Katrina need them as that fear starts to rise up down here. So glad you shared your experience and you and your family will be in my prayers. Keep me updated as to how you are doing, if you can. stacy, thanks. my elderly parents live in baton rouge, and their church still has folks from katrina, plugged in and being part of the family of faith. god's power is seen not so much in the force of a wind that snaps 50 foot trees like string beans, but in the generosity of folks like daphne and you. i'm here in houston, praying. thank you for your faith. I lived in New Orleans for a 9-month internship with an inner city ministry a few years back, and I have kept in touch with my friends there. They are currently camped out in Alabama, having evacuated for the second time in three years. It's going better this time, but still...please pray for Urban Impact Ministries. Thanks for asking for the prayers, Stacy. The people going through this need them so much. 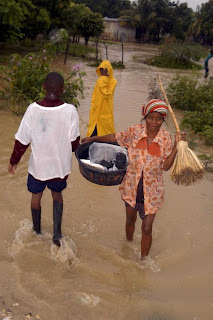 110 lives lost in haiti from mudslides and flooding just since august. horrific. please keep praying!